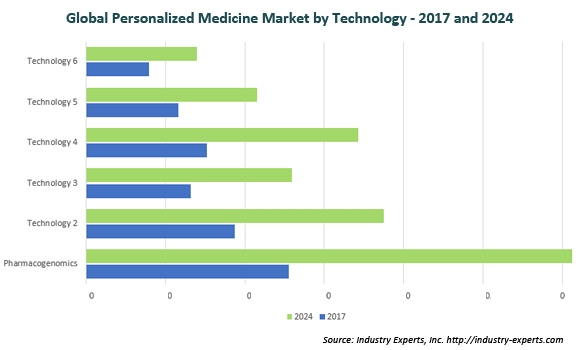 Personalized Medicine Global Market to Reach nearly $200 Billion by 2024, Owing to Huge Patient Data Availability, Advanced Analytics and Customized Medicine – Market Report (2017-2024) by Industry Experts, Inc.
Industry Experts, Inc. released the updated version of its global market report on Personalized Medicine. The new report entitled "Global Personalized Medicine Market – Types, Technologies and Applications" reveals that the global market for Personalized Medicine is forecast to touch US$102.7 billion in 2018. Personalized medicine has a huge potential in leading the healthcare industry with drastic changes with a key focus on diseases understanding & management integrated with advanced analytics, patient data, customized medicines and other possibilities. Personalized Medicine will transform the entire pharmaceutical value chain, from early development to companies' go-to-market models, and the next five years will be a crucial window for pharmaceutical companies to capitalize on this promise. Companies simply cannot sit on the sidelines during this period. Instead, they need to take risks and more actively engage with stakeholders throughout the healthcare ecosystem. However, there seems to be some challenges such as an unclear regulatory framework, insufficient access to high-quality data, data privacy issues and lack of standards. Global Personalized Medicine market is expected to witness a robust CAGR of over 11% during the 2017-2024 analysis period and projected to touch US$194.4 billion by 2024 from an estimated US$92.4 billion in 2017. By application, Oncology is estimated the largest market accounting for about 30% throughout the analysis period. The market for personalized medicine types analyzed in this study includes Personalized Medicine Diagnostics, Personalized Medical Care, Personalized Medicine Therapeutics and Personalized Nutrition & Wellness. The report also analyzes the market for personalized medicine technologies comprising Pharmacogenomics, Point-of-Care Testing, Stem Cell Therapy, Pharmacoproteomics, Pharmacogenetics and Other Technologies. Personalized Medicine applicationsÕ market explored in this study include Oncology, Central Nervous System (CNS), Immunology, Respiratory and Other Applications. This report reviews, analyzes and projects the personalized medicine market for the global and regional markets including the North America, Europe, Asia-Pacific, South America and Rest of World in terms of USD Million for the period 2015-2024. The regional markets further analyzed for 12 independent countries across North America – The United States, Canada and Mexico; Europe – France, Germany, Italy and The United Kingdom; Asia-Pacific – China, India and Japan; and South America – Argentina and Brazil. This 386 page global market report includes 171 charts (includes a data table and graphical representation for each table), supported with meaningful and easy to understand graphical presentation of the market. The statistical tables represent the data for the global market by geographic region, product type, application and technology. The report covers the brief business profiles of 16 key global players and 73 major players across the North America – 43; Europe – 24; Asia-Pacific – 4; and Rest of World – 2. The report also provides the listing of the companies that are engaged in research, development and commercialization of personalized medicine technologies and products. The global list covers the addresses, contact details and the website addresses of 115 companies. California, USA based Industry Experts, Inc. is a multi-industry focused business information provider. Subscribe now and start receiving the latest updates from Industry Experts on new market research reports, key industry news and more via email. d --- s is a symbolic representation of our customer's belief that our research reports will play a crucial role to DEFINE the right strategy and execute through to the SUCCESS. © 2019 Industry Experts, Inc.